Think of a challenging parenting situation which you’ve been dealing with for a few months or perhaps a few years. It might involve concerns about your child’s performance at school, use of digital devices, friendships, lying, negative attitude or use of drugs. These unsolved problems can drain you emotionally. When you think about the problem you might find yourself feeling angry, worried or sad. What do you do to feel better? You might distract yourself with a favorite activity or perhaps a large glass of wine. While this does nothing to solve the problem, at least you temporarily feel better. Perhaps you try once again to change your children’s behavior by talking to them or punishing them. You know this hasn’t worked in the past but you don’t know what else to do. Or maybe you remind yourself that your child is going through a phase which should be over soon. Parents dealing with ongoing problems describe feeling like being on a roller coaster. They seesaw between feeling ok and feeling terrible. They get pushed from one side to the other by events and their own thoughts. Laurie first became concerned about her son, Aiden, when he was 10. He came home from a friend’s house smelling of smoke. When she questioned him about this he blamed his friend’s mom for smoking around him. Laurie knew this woman did not smoke and soon Aiden admitted he had tried smoking with his friend. She grounded him at home for a couple days and he promised never to do it again. The next big incident happened a couple years later when Laurie picked Aiden up from a party. His words slurred and he confessed he had been drinking. Laurie told Aiden he could not go to this friend’s house again but his friend was welcome to come to their home. Next Aiden’s grades started slipping. When she talked to him about his grades, he claimed school had gotten boring but agreed to work harder on turning in all his assignments. Each time Aiden reassured her that he would change his behavior she felt better. However, it wasn’t long before Aiden would have another red flag behavior. She was increasingly feeling angry or worried most of the time. Laurie felt like she was on a pendulum swinging back and forth without making any real progress. She would get angry and punish Aiden. He would apologize. Before long there would be another incident. She was discouraged because nothing she did seemed to work. Can you relate to having a problem like this? When you are experiencing strong negative feelings like anger or frustration, you cannot do your best thinking. Keeping these feelings in mind, she realizes she is curious about many things. She does not know what Aiden is going through with his friends, school and sports. What are his biggest worries? What does he do when he feels stressed? Does he see any drawbacks in drinking and using drugs? How does he handle situations where he’s uncomfortable with what his friends are doing? Laurie feels empowered by having this difficult conversation with Aiden. She realizes she cannot change Aiden’s behavior but she can change how she approaches him. Previously she was yelling at him and punishing him. This put more distance between them without resolving the underlying problems. Problems that have been going on for a few months or years are going to take time to solve. One good conversation is a healthy start. You will want to connect regularly to keep on top of the problem resolution. Weekly family meetings are one way to connect with each other regularly. Whatever problems one person in a family is experiencing affects everyone in the family. Pulling together to support each other creates a more loving atmosphere. During your family meetings you are likely to discuss problems that are causing anger or frustration. 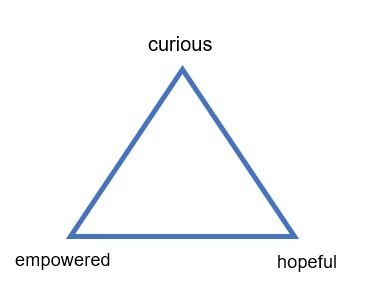 Use this opportunity to explain how the triangle of three positive feelings can help. Being able to approach problems from this perspective will increase the likelihood of finding a solution. Take notes so you can look back at the progress your family makes as you solve problems together!